Had a good, but not terribly substantial breakfast - the caramel apple French Toast was a little sweet even for my taste. There was fruit and sausage also. We were on the road at 8:30, and soon were on a dirt road called "Hole-in-the-Rock Road". 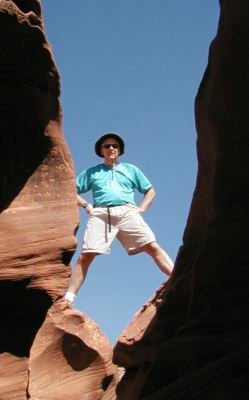 Eventually it ends up at Lake Powell, but we weren't going nearly that far! The road was washboardy, but Lee soon discovered that by driving about 35-40 mph we skipped over most of the bumps and got a fairly smooth ride. 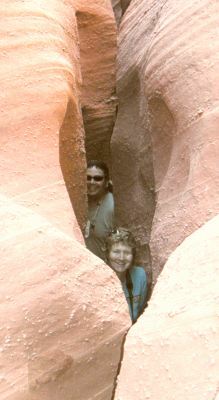 :-) It took us not quite an hour to get to Dry Fork, which was the trailhead for Peek-a-boo and Spooky Gulches. 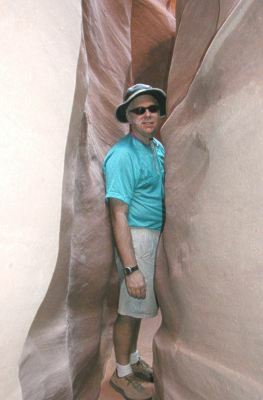 These are very narrow slot canyons that you can hike into, though they are only about 10" wide in places! 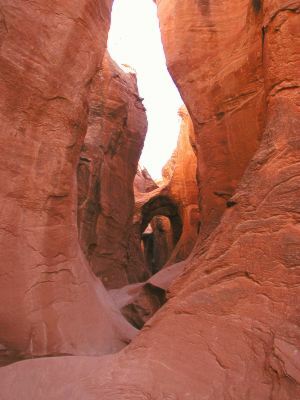 Because of the way that the sandstone erodes during flash floods, these canyons tend to erode straight down rather than in a "V" shape like a river valley. So you can look up and see daylight 20-30 feet above you, but the top of the canyon isn't a whole lot wider than the bottom. 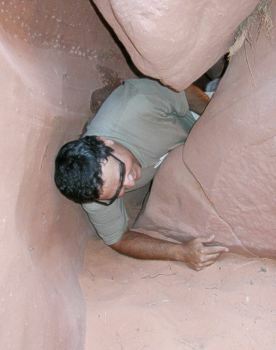 Lee is a bit claustrophobic and was not entirely sure about doing these, but he went along. Spooky Gulch was even narrower than Peek-a-boo - we again left our packs near the entrance as it got *very* narrow *very* quickly. I got a couple hundred yards ahead and didn't find anyplace that was wider than 40", and most of it was more like 14" - except where it went down to 8 or 10". :-) Lee decided not to come any further, but instead he surprised us later by being up *above* us - he had climbed out of the gulch and followed along the top. 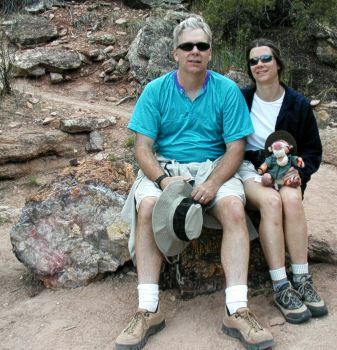 It was really a very cool hike - we were having to climb over some rocks and squeeze through in places, but Walt and Barb and I had a lot of fun, and we stopped for a lot of pictures. This was definitely one of the highlights of the trip for us. 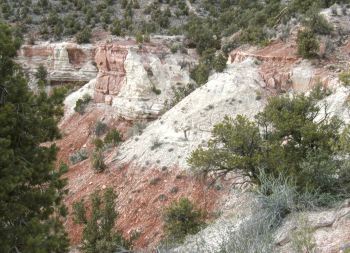 We took a side road to "Early Weed Bench" for a view of Escalante canyon...the road was bumpy and it was pretty slow going, and there was not a great deal to see once we got there. 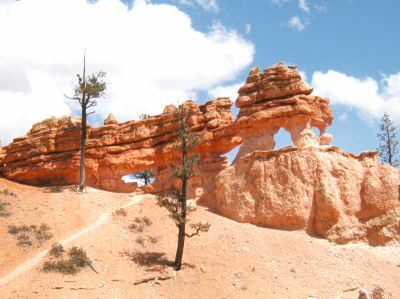 Then we went back up Hole-in-the-Wall road to the Devil's Garden (alert readers will recall that we visited a Devil's Garden in Arches, too!). 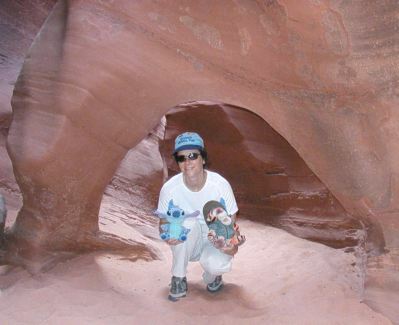 This was a fun place to walk around - there were lots of interesting rock formations. And several arches. 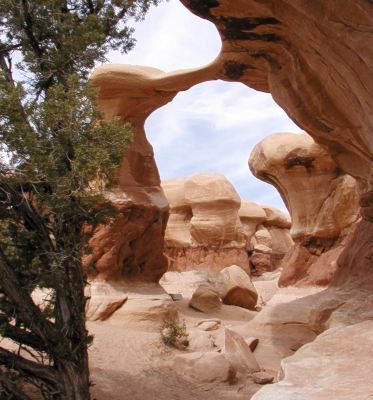 :-) Which brings us to today's "Arch of the Day" - Metate Arch in the Devil's Garden. We wandered around taking pictures for about an hour, and were able to cover the entire area. It was 7:00 or so by the time we got back to Escalante, and we had dinner at the Ponderosa Restaurant. Unfortunately our timing was NOT good - the restaurant was packed and only one waitress was working! It took her a long time to get to us, but once she did we got our food fairly quickly, since the kitchen was caught up. The food was pretty good, and fairly inexpensive. After we paid our entrance fees we went off to Shakespeare Arch while they went into the main part of the park, and we didn't see them there later. 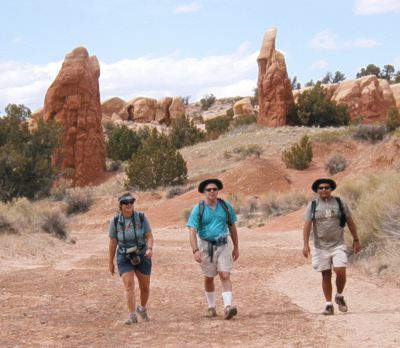 The trail to Shakespeare Arch was a nature trail, and only about a mile long (round trip). The arch would have been more impressive if we'd been there in the afternoon - it was shaded in the morning. It's actually a relatively recent discovery - a ranger (named Tom Shakespeare) found it back in 1976 while looking for a coyote den. We drove into the main section of the park to the Panorama Trail - we did 3.2 miles of this loop trail (the entire loop is about 5 miles). 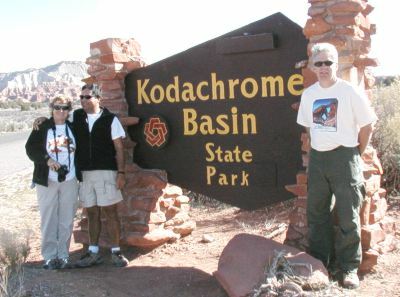 Kodachrome Basin was pretty but it didn't really grab us - maybe it would have been more impressive if we hadn't already been to Arches and Capitol Reef. It was another windy day, and we'd heard that there were afternoon snow showers forecast in Bryce, where we were heading, so we didn't spend any more time in Kodachrome Basin. In Tropic we stopped for lunch at the Bryce Canyon Inn and then checked into our B&B - the Bryce Point Bed and Breakfast. It was run by an older couple, Lamar and Ethel, who could not have been nicer. We were in the "Lyn and Karen" and Walt and Barb were in the "Susan and Jon". The rooms were quite large and very comfortable - and they had a table and chairs!!! 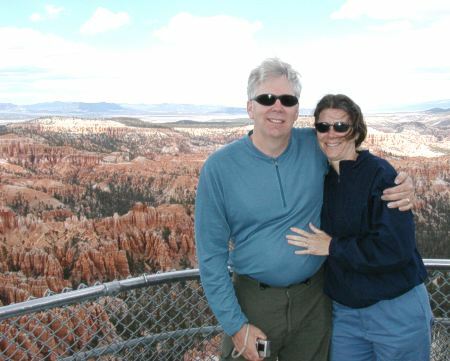 We unloaded our bags but kept our hiking gear and drove into Bryce Canyon National Park. I'd last been here with my friend Karen in 1980...I'd forgotten how beautiful it is. Pictures just do not do justice to the marvelous colors in the rock. We stopped to do the hike up to Mossy Cave - which also had some very nice views of some hoodoos. And what, you may ask, is a "hoodoo"? 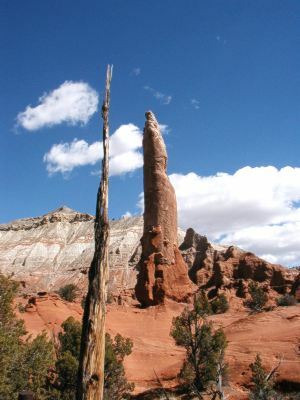 According to the definition, it's "a pinnacle, or odd-shaped rock left standing by the forces of erosion". 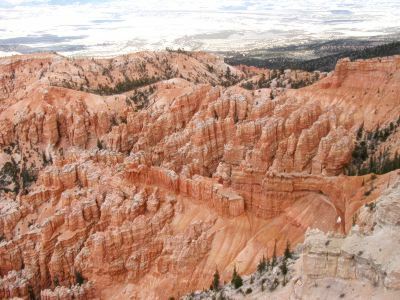 There's an awful lot of hoodoos in Utah. 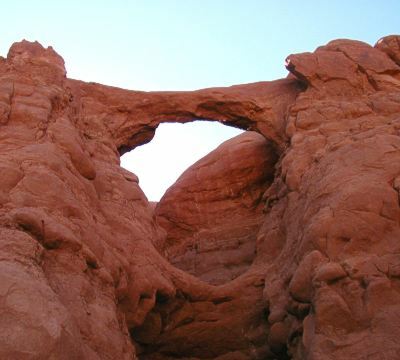 :-) Today's "Arch of the Day" was taken from the trail to Mossy Cave. 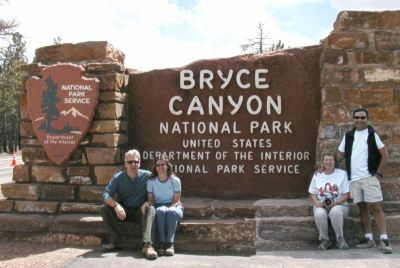 It was a little late in the afternoon to do any hikes in the canyon (and the weather was looking iffy), so we took the scenic drive and stopped at all of the viewpoints. Did I mention that it was *cold*? We were up over 8000', and with the wind it had turned quite chilly. 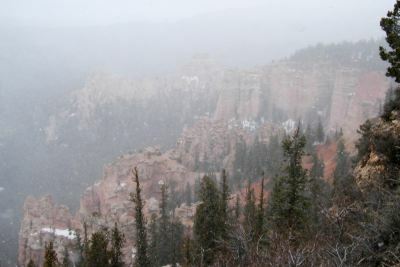 One of our first photo stops was at Bryce Point, and as we were walking back to the car it started snowing on us a little bit! By the time we got to Farview Point it was really snowing, though it wasn't sticking. But we kept going in and out of the storm as we drove along, so at most of the viewpoints we actually got a little bit of sun if we waited long enough. It must have been about 6:00 by the time we finished, and we were hungry so we went to Ruby's Inn (the HUGE tourist area just outside the national park) for dinner. In front of us in the line to get into the restaurant was one of the couples we'd been seeing at the viewpoints, and we exchanged pleasantries while we waited. When we got to the podium, they didn't have tables for two or four, but they had a table for six, so we all sat and had dinner together. It was a pretty good dinner - the food was good and the portions were large. And we enjoyed talking to our dinner companions. After dinner we drove back to our B&B in Tropic and called it a day. It had a hot tub, which Walt and Barb took advantage of, but getting out there required going outside where it was *cold*, so I passed.